Whether you're a professional heating company looking for the latest in time-saving, cost-effective solutions for your advanced heating and insulation projects, or a Do-It-Yourselfer looking for the same solutions along with some industry recognized expert advice, we welcome you to Hydronic Specialty Supply. The most efficient way to operate an advanced biomass heating boiler, such as a wood gasification boiler, is by running it at maximum output throughout the burn and charging thermal storage tanks. A loading unit allows smooth charging of the thermal storage tank(s) while maintaining a proper return water temperature of 140 degrees F. This feature is important to protect you boiler from the corrosive effects of flue-gas condensation and thermal shock. A Loading Unit will charge your tanks smoothly while maximizing the service-life of your boiler. See our full line of loading units a mixing valves here. 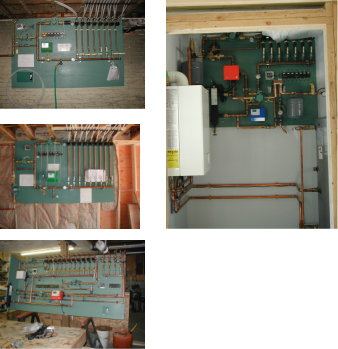 Whether it be 120 gallon 'buffer' tank to smooth out and maximize the efficiency of your mod-con gas boiler or 500-1000 gallons for effective use of your wood-gasification boiler, we offer the finest in tank construction. We can also design and fabricate tanks to your specific needs to accomodate domestic water as well as thermal solar integration. Here at Hydronic Specialty Supply we understand that your time is vaulable. Although you'd love to be able to take the time to learn to design, then design, source the parts and fittings, and then finally assemble your 'dream manifold' for your heating system, we believe our experienced team can take alot of the hastle out of your project so you can enjoy your life and your heating system quickly. You'll be proud to show off your manifold and we'll let you take all the credit as you'll still have to make a few minor connections in the field to complete your project. We look forward to being a part of your "Project Team"!